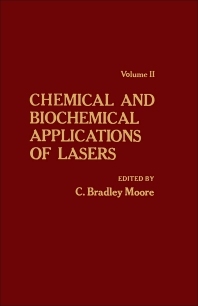 Chemical and Biochemical Applications of Lasers, Volume II illustrates the current and potential applications of lasers in new fields of research in chemistry, biology, and other important fields. The book covers the laser spectroscopy of molecular jets; methods of high-resolution spectroscopy; vibrational relaxation in condensed phases; the distributions of quantum states encountered in chemical lasers and laser-induced chemical reactions; the hydrodynamics of biological systems; and developments in lasers such as the rare gas halide ultraviolet laser, which will find important new applications in chemistry and biology. Chemists, biologists, and physicists will find the book educational and insightful.